NASSCO is the largest, full service shipyard on the West Coast of the United States, capable of maintaining or repairing any ocean-going vessel. Because of our location, expertise and shipyard capabilities, NASSCO is a Master Ship Repair contractor for the U.S. Navy and serves as a principal repair facility for its Pacific Fleet ships. 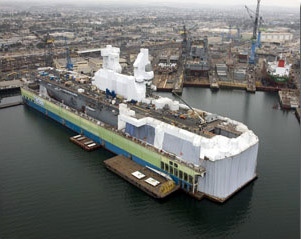 Since 2002, NASSCO has been the Navy’s prime contractor for the continuous maintenance of several amphibious classes of ships homeported on the West Coast. Long-term contracts have been awarded to the company to provide maintenance and repair services on LHA-class and LHD-class ships, LSD 41 / LSD 49-class ships and LPD 4-class ships. NASSCO also has been awarded a contract to provide similar maintenance and repair services for FFG 7-class ships in San Diego. NASSCO participates in the repair of other ship classes in San Diego and provides maintenance service to other Pacific Fleet ships that make port calls to San Diego. NASSCO’s repair experience includes major structural and piping modifications, machinery repairs and alterations, combat systems and electronics upgrades, ship conversions and emergency repairs.